A good place to start is learning about different tent styles There are sailcloth, clear top, century, frame and several other styles of tents. Each is a different aesthetic, size and shape, creating a different base and environment to build upon. They have varying spatial elements and design challenges, everything from where tent poles may be located, does it land in the center of your dance floor? Or guiding frame and wire lines that you might consider masking or utilizing for unique design elements! One common attribute, however, is that they are a blank canvas and you can create whatever look or design you desire inside it! You might consider a clear span tent in the fall, bring the beautiful foliage in as a design feature, and you won’t have to worry about a greenhouse effect in the cooler temperatures! 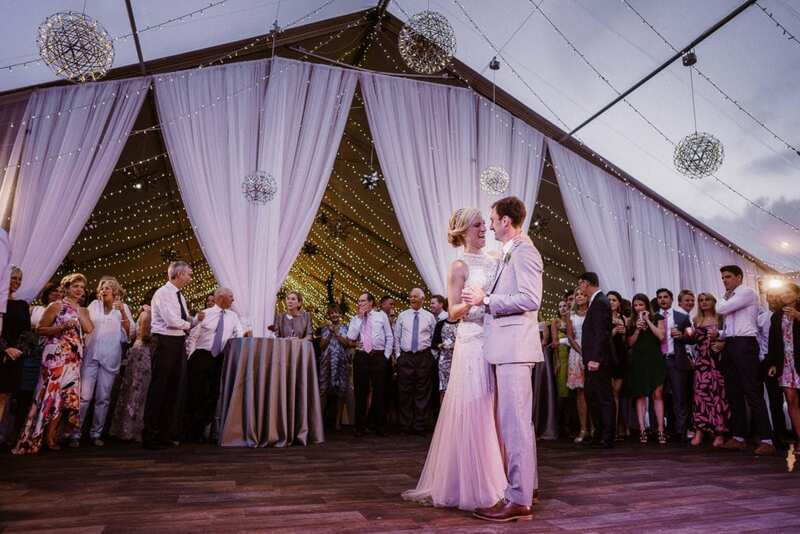 Looking for a softer, more romantic design, perhaps a sailcloth tent is your choice. Its often ivory undertones lighten the edges and it’s semi-transparent ceiling allows shadowing and sunlight to become a part of the environment! Whichever it is that you choose, remember that a tent isn’t a lack of a venue, but an opportunity to create your own! When you plan without four permanent walls, you must consider weather complications on your big day! A tent is not grounded like a permanent venue is, even semi-permanent floors are not technically grounded. A lightning storm might disrupt your grandfather’s speech, high winds, have blown tents into the ocean, heavy rains could flood the center of your tent. These are all extreme weather conditions that we have to plan for and work around when the worst happens. Luckily, your tenting companies and wedding professionals do this for a living, and they will help create plans and see them through if necessary! On an easier to manage scale, temperatures can also be quite fickle! This can often be solved with heaters & fans, but remember, this is still an important factor to consider. However, whether it means investing in a floor, or bringing in an AC unit, the same lack of permanence is what makes tented weddings so desirable! You and your guests can enjoy that cool summer breeze, you can feel the sun shining down on you, or enjoy the foliage of that perfect New England autumn. You and your guests have easy in and out access to nature’s best, whether it’s gloriously manicured gardens or sand between your toes, it’s four steps to the left and you’re there! Building from the Ground Up Tenting on historical properties, private estates, parklands, farms, and other undeveloped areas means that you are bringing in everything. Everything means a kitchen, kitchen appliances, bathrooms, electrical power, lighting, garbage disposal, all your tables, chairs, stage… the list goes on and on, and the endless array of things that permanent venues already have on property! This directly correlates with your budget. The benefits of that outdoor feel, or the opportunity to host your event at your family home also means that perhaps there’s a little more budgeting to monitor. Rentals can quickly add up when you are building from the ground up. The upside to this, however, is that you can custom tailor everything. 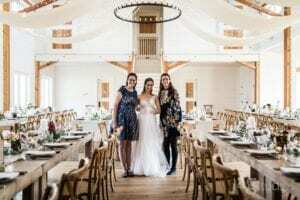 A permanent venue may see similar weddings several weeks in a row, a tented space could see several very different variations in that same timeframe. Prioritize, ask questions, learn why one table is more expensive than the other, find out if there have ever been weather problems at that site, educate yourself and surround yourself with a creative team you trust and your tented event will be amazing!